Texas weather demands a refreshing libation practically year-round, and there’s none more refreshing than a grapefruit rickey. 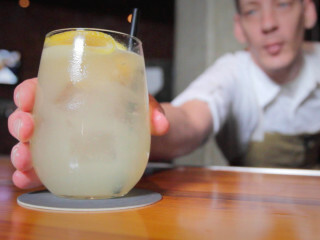 Turns out this is the most popular cocktail at Fort Worth’s Thirteen Pies, so we asked head bartender John Cocke to show us how it’s done. The foundation of this cocktail: the fresh-squeezed grapefruit juice. “It has that nice little sweet and sour from the grapefruit and a little bit of floral notes from the elderflower liqueur,” he adds. Splash of club soda, pour it over ice, and garnish with grapefruit. To see the recipe done step by step, watch the video.